This is a guest post by one of my closest friends (for almost two decades now! ), Erin, who recently started her very own food blog – The Open Road Kitchen. Be sure to check it out and also follow her on Facebook and/or Instagram for updates! I consider myself an open-minded friend. 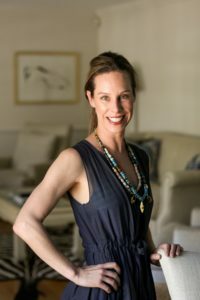 But when my dear comrade, Lisa Leake, first introduced me to her 100 Days of Real Food idea (back in 2010), I have to admit I had a difficult time not judging her decision to eliminate processed foods. The Lisa and Jason I’d known for years were just like me and my husband: total foodies open to trying anything, at least once. However, that night as we dined at one of our favorite restaurants here in Charlotte, I could tell something had suddenly and drastically changed my friends’ approach to food. Rather than enjoying how artistically the menu was curated, they instead dissected it for its exclusion of things like organic vegetables and locally raised, grass-fed beef. And, to my dismay, they actually demanded the attention of the head chef to discuss the menu and what items would be appropriate to order based on their 100 Days “purity” pledge. I can’t even remember what they ordered. But as the night concluded, I realized that their commitment to cutting out processed foods was not only about changing their approach to eating. It was about pushing a movement forward for the education of all. To educate is to become an expert on your subject and to understand the obstacles that the weary present you. This is the beauty of 100 Days of Real Food. It starts as a challenge to try to cut out processed foods by teaching you what qualifies as real food and what foods to avoid. It then enables you to evolve as a consumer to make wise decisions at the market and to delight in enriched meals in the kitchen. It may surprise you that my approach to cooking is not driven by the whole foods movement. However, while looking at the 100 Days of Real Food rules, I discovered that dishes can inherently qualify as unprocessed by simply using great (from scratch) ingredients and an abundance of flavors. Actually, I took this finding and applied it to how I categorize recipes on my new blog, The Open Road Kitchen. If I thought classifications like “vegetarian, soups, sides, 10 ingredients or less, etc.” warranted inclusion for searching recipes, then “real food approved” did as well. I am more than pleased to report that 19 of my 30 posted recipes (so far) are real food approved! It’s amazing to think that my style of cooking from scratch, without the intention of being real food approved, can produce recipes like Coconut Quinoa with Basil and Baby Spinach, Moroccan Spiced Carrot and Yogurt Dip, Roasted Fennel and Tomato Soup, and Thai Peanut Dip that nonetheless follow the guidelines set forth by Lisa. 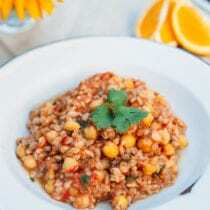 One favorite recipe that stands out as real food approved is my Chickpea and Farro Stew, which I am sharing below. It is a humble yet savory dish layered with flavors like freshly squeezed orange juice, cumin, and garlic. The recipe utilizes the overnight soaking method of preparing dried legumes (e.g., chickpeas) and then stews them with petite, diced tomatoes, onions, and low-sodium chicken broth. 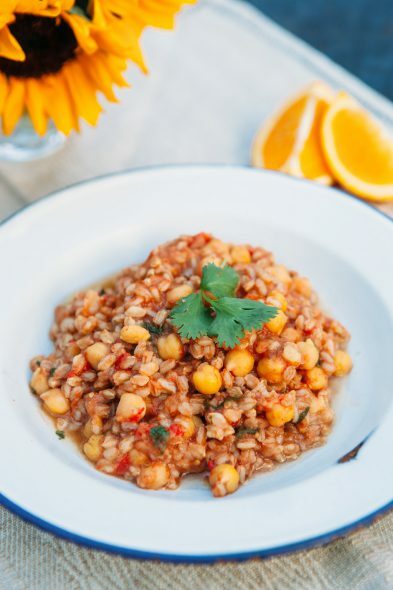 As you’ll find below, the stew is a beautiful dish finished with cooked farro and fresh cilantro to enjoy hot off the stove or reheated days later. Enjoy! And, here’s to happy, healthy eating as it comes to us by chance or as it enlightens a change. The night before cooking the stew, place the dried chickpeas in a large bowl and cover with the water. Transfer to the refrigerator and leave to soak overnight. The next day, drain the chickpeas. Heat a large sauté pan (for which you have a tightly fitted lid) over medium heat for one minute. Transfer the drained chickpeas and baking soda to the pan. Shake the pan to distribute the baking soda amongst the chickpeas and cook, stirring constantly for 5 minutes. Add the chicken broth, tomatoes, onion, garlic, salt, black pepper, and cumin and to the pan. Increase the heat to high and bring to a boil. Once boiling, cover the pan, reduce the heat to low, and cook the chickpeas and vegetables for 45 minutes. In a fine mesh colander, rinse the farro well and drain. Add it to the pan, cover, and cook an additional 45 minutes. To finish the stew, stir in the freshly squeezed orange juice, honey, butter, and fresh cilantro. Let rest 10 minutes, uncovered, and serve warm. How would this be adjusted if I used canned beans? Can I then just put the farro in at the same time as stock, etc, and cook everything for 45 minutes only? I don’t have time for 1.5 hours of cooking during the week as a full-time working mom. How would I modify this if I used canned beans? Can I put the farro in at the same time as stock etc and cook everything for 45 minutes only? As a full-time working mom, I don’t have time for 1.5 hours of cooking on a weeknight!! Yes, that’s what I did-I had already cooked chickpeas from scratch in my freezer. Also Trader Joe’s sells 10 minute farro, already parboiled. Made it a very quick dinner! Can you substitute fresh tomatoes for canned? If so, what would be the best kind, and do you need to add anything to them (e.g., spices)? I finally got around to making this recipe! It was so delicious, hearty, and filling. I will definitely make it again on a cold winter day!